-Located in the southeast corner of castlewood canyon, Wendell Spire holds routes along the wall for close to 400 feet where a natural break in the canyon wall separates the Corporate View Block and the Spire. Come challenge your patience and forearms in this awesome area. 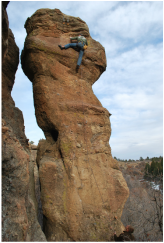 - As one of the easier sport routes in Castlewood Canyon it is perfect for a lead climber of any skill level. With 5 bolts and plenty of large stepladder like footholds set on the side of a large crack, this climb is a good climb to stretch out on at the beginning of the day or save for the end of a long day where you want to fit one last climb in. 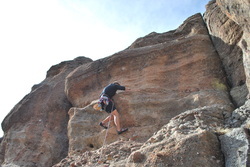 To find this climb, look for Phalloid Void as a marker. Noodlers' Nightmare will be 9 routes to the left. Tom surmounting the crux of "Bag of Tricks"
-This Route is a perfect mid level climb. An east start soon gives way to a ledge which you can rest ponder how to move passed the crux of this route. You will need to pull out a "bag of tricks" because there is no best way to ascend the crack. With a ceiling on the right and a wall on the left, any combination of leg spreads and ingenious body positions will get you up. From there is is smooth sailing. To reach this climb, continue on the trail until you reach a large boulder. Take a right and head through the brush to the rock face which is Wendell Spire. Look for Phalloid Void as a marker, and Bag of Tricks will be 7 routes to the left. Tom finishing a flag move on "Phalloid Void"
- Possibly one of the more rewarding climbs in the park. A very obvious spire creates a knife edge between the Wendell Spire area and the east end of the park where then caves and cutouts line the rim. With 5 clips this climb is not tedious, but truly requires back muscles of steel. The climb starts off on a left slanting hand-width crack ending with a transfer to pocket holds about a third of the way up. It then continues over two bulges witch both provide a relief in the form of a jug or good pinch hold over the top of them. The climb finishes off with good foothold for clipping positions and an incredible view of the canyon floor if you can manage to peak your head over. To reach this climb, follow the trail west as it parallels the river. When you reach a large boulder take a right and head through the brush to the rock face which is Wendell Spire.You can't miss Phalloid Void as it emerges directly in front of you. Luke pulling over a ridge on "Svengali"
-This climb is a route that you may have to mentally prepare for before attempting. It has a 4 clips some sitting just below the 3 bulge like ridges. In order to crest these ridges get your body over the top of each and mantle with your outside foot. For a shorter climber like myself getting my upper torso over the ledges provided to be quite tricky. After a few attempts i managed to squeeze over. The key is figuring out your own body position that will work with the lack of footholds. Overall it is worth doing once, but this was not my favorite route due to the lack of dynamic moves and sparse reachy holds. To reach this climb, follow the trail west as it parallels the river. When you reach a large boulder take a right and head through the brush to the rock face which is Wendell Spire.You can't miss Phalloid Void as it emerges directly in front of you. Svengali is one route to the left of Phalloid. 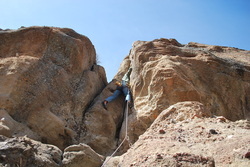 -To reach the climbing area, continue passed the east entrance visitors center to the end of the parking lot. This visitors center is a right turn about 5 minutes down the road on Route 83. Start descending down the "Canyon View Nature Trail". At the bottom you will find a bridge and cross the Cherry Creek River. Follow the trail west as it parallels the river. When you reach a large boulder or phallic block take a right and head through the brush to the rock face which is Wendell Spire. Look fro Phalloid Void as a Marker. The entire Wendell Spire area is 26 or so routes long.